Young adult children: Are you included in their medical decisions? When your young adult children reach the age of 18 or 19, you might be surprised to learn that you no longer have access to their medical information, even if they’re still on your health insurance plan or live with you. Once your child reaches legal adulthood (18 in most states, 19 in two states), you don’t have the right to receive information from medical providers about their healthcare without your child’s authorization. That can be a problem, especially if your young adult child is seriously ill or injured or living with a chronic health problem. Although medical providers can choose to share information with parents or guardians without the patient’s authorization if they feel it’s in the patient’s best interest, many feel uncomfortable circumventing patient privacy regulations. That can be especially true if they’ve never met the parents and don’t know what the parent-child relationship is like. If your child is not able to make medical decisions for him or herself and hasn’t authorized you to do so, a physician or hospital representative may be appointed as your child’s caregiver and given the power to make medical decisions. Healthcare providers may not be aware of the child’s and family’s health history, for example past diagnoses and treatments and health risk factors such as heart disease and allergies to medications, because they don’t have access to your child’s medical records. If your child can’t communicate, providers may not know what his or her wishes are regarding the use of a ventilator, feeding tube, or other life-extending measures. You won’t have the opportunity to ask questions about the potential treatment options for your child’s condition and help him or her make an informed medical decision. 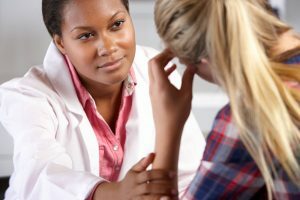 The first step to ensuring that you’re included in medical decisions for your young adult children is to have a discussion with them about the topic. Let them know that your goal is not to override their decisions or invade their privacy, but rather to provide needed information and support, especially in the case of an emergency. HIPAA release or authorization: This form allows healthcare providers to release medical information to anyone your child specifies on the form. If your child is concerned about sharing certain types of medical information, for example information about sexual health or drug use, he or she has the option to limit what types of information can be shared with you. Medical power of attorney: This form, also known as healthcare power of attorney, designation of healthcare proxy, or durable power of attorney for health care, allows your child to choose an agent to make medical decisions if he or she cannot make them. If your child is living or attending school in another state, it may be wise to have him or her complete a form for both states, since regulations and requirements may vary. You may also want to talk with your children about writing an advanced care plan to outline what types of interventions they want if they face a life-threatening illness or injury. If your children will be studying, traveling, or working abroad, they may want to consider completing a durable power of attorney as well. While this form is not healthcare-related, it does give parents or guardians the ability handle financial and other tasks, such as transferring money between bank accounts, filing tax forms, and paying bills if the child is not able to. There are several apps that will allow your children to carry these important documents with them on their phone. Another option is for your children to have an electronic universal medical record that includes their records from all their doctors as well as the needed HIPAA releases, power of attorney forms, and advanced care plans. Be taking these proactive steps, you’ll be able to help your young adult children make informed medical decisions and get the care they need, no matter where they live.